Eggland’s Best Reveals Its New “CEO” (Chief Egg Officer)! CEDAR KNOLLS, N.J., September 15, 2015 – Eggland’s Best searched from the mountains to the prairies for their next Chief Egg Officer (“CEO”), only to discover the winning candidate was located right in their backyard! 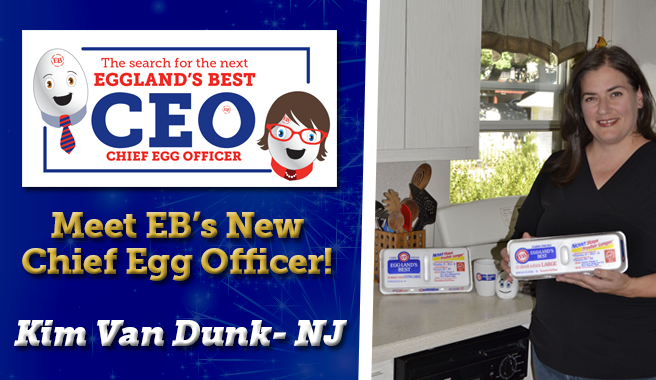 New Jersey resident Kim Van Dunk has officially been named the Grand Prize winner of the Eggland’s Best “Chief Egg Officer Search” Contest earning her the honorary “CEO” title. Along with her new title, Van Dunk has been awarded $5,000 and a one-year supply of Eggland’s Best eggs. The two runners-up of this year’s “CEO” contest will each receive a $500 cash prize and six month supply of Eggland’s Best eggs, which contain 25 percent less saturated fat, four times more vitamin D and ten times more vitamin E than ordinary eggs. In addition to her $5,000 cash prize and year supply of Eggland’s Best eggs, Van Dunk will be receiving a nutrition consultation from Registered Dietitians Tammy Lakatos Shames and Lyssie Lakatos, also known as The Nutrition Twins.